When Howard Webb set out to monitor turnover in Whitecliff Quarry Lake, his custom-built system of temperature sensors worked perfectly. Until the muskrats showed up. Webb, a volunteer with the Lakes of Missouri Volunteer Program, devised an inexpensive array to monitor the lake in St. Louis’ Crestwood suburb. His design for looking at the effect of temperature turnover on algae cycling centered on iButtons, small metal loggers that were very reliable, but not waterproof. That meant Webb had to find an equally inexpensive way to keep them dry. The solution? Small Nalgene water bottles to hold the loggers. Muskrats, however, mistook the bottles – which became covered in algae – for food, tearing into them and flooding the iButtons. The first design used Nalgene bottles and plastic bags to keep the iButtons dry, but an updated design added PVC pipe as a protective housing to hold the bottles. “At that point, we were just looking for something a muskrat wouldn’t chew through easily and I just happened to have some around,” Webb said. The iButtons are attached to a chain that hangs in the water column suspended from a buoy. The buoy is also a product of Webb’s knack for homespun design. “The buoy is a piece of PVC pipe with a swimming pool noodle in it,” he said. The chain is tethered to a concrete cinder block that acts as an anchor. If the array is ever vandalized, Webb said he can easily use a grappling hook to latch onto the cinder block and retrieve it. 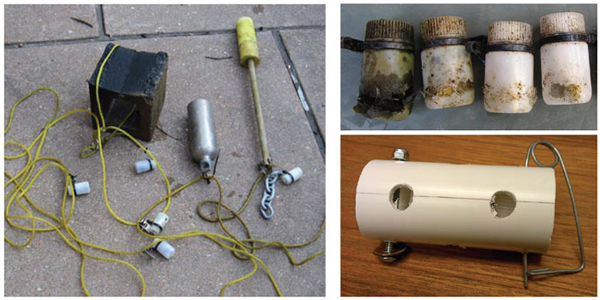 In all, the sensor setup is a cost-effective way for the Lakes of Missouri Volunteer Program to collect data, which Webb said are very high quality. The organization has quality control measures in place that verify results so data are trustworthy enough for inclusion in research papers and government reports. Cost for the whole array is around $200, which is mostly for the cost of the iButton sensors. The Nalgene bottles run 80 cents each and PVC pipe costs a few dollars for a 10-foot section. “The key word on the project is ‘cheap,’” Webb said. But the data coming out of Whitecliff Lake are anything but cheap, Webb said, noting that the data plots have been clear and easy to understand. The entire array could easily be replicated for deployments across the state of Missouri.